The Mausoleum at Memorial Park Cemetery. As one of the oldest cemeteries in the area, Memorial Park Cemetery, located in the heart of Oklahoma, has been a favorite final resting choice for families in the Oklahoma City area. Established in the late 1920s, the legacy of Memorial Park Cemetery lives on today. The Memorial Park Cemetery and Mausoleum, situated on the wide plains of the Midwest, is also the final resting place of many notables, including Senators, Representatives, singers and sportsmen and religious persons. Co-founder of Braniff International Airlines, Paul Braniff is buried here, as is Major League baseball player Johnny Leonard Roosevelt ?Pepper? Martin and famous aviator and barnstormer pilot Wiley Post. 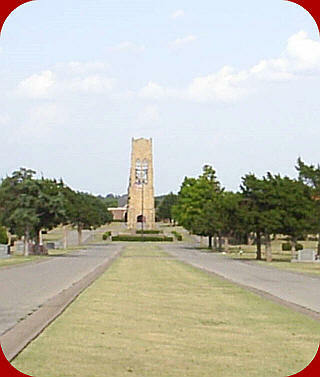 Located just northeast of downtown Oklahoma City, Memorial Park Cemetery and Mausoleum may be accessed from State Route 77 or the Oklahoma City John Kilpatrick Turnpike with a turnoff on North Kelley Avenue. Greenhaw, Frank J. & Bertha "Rusty"
Hinchee, George W. (Dr.) & Hattie E.
images courtesy of Zoey Fryhover, August 2006.